Our final sign in the Moon’s journey is Pisces. Since the Moon is it’s strongest when it falls in the sign of Cancer. 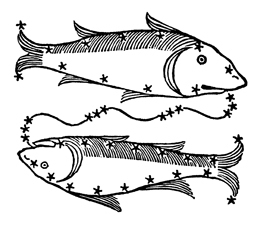 Caner is also trine the sign of Pisces. Both are water signs. This indicates that the Moon is pretty strong in the sign of Pisces. There is a great deal of sensitivity when it the sign of Pisces. It can also be a time of regret, either about things in the past or something going on at that time. There is not only a sensitive nature to this energy but a very reflective energy as well. Pisces is the sign that rules Neptune and here we might think about the energies of compassion and sympathy. It might be a time when we can not only be more reflective but also more compassionate to the plight of others. If the Moon is the place of emotional security then in the sign of Pisces the idea of emotional security might be related to being a friend to someone who is down and out. There can be a deep knowing when the energy of the Moon is traveling through the sign of Pisces. This can be a very intuitive energy. With this added sensitivity it may not be the best time to throw a party. Ironically, it could end up being a time when most can easily drink more than they should. It is not a good time for recreation drugs or alcohol, the tendency to overdo it could be great. This would be an opportunity for one of those “regret” possibilities. Due to the fact that people overall could be sensitive indicates this is not the time to offend someone else, because it could happen so easily. Misunderstandings are also likely because this is not a very “decisive” time. Plans that are put into effect at these times could tend to be too idealistic, making it difficult to keep the energy up when there is more clarity and reality comes to light. When we think of those people who have their natal moon in the sign of Pisces, we think of someone who is so sensitive they can pick up the moods of those who are around them. This also makes the Pisces moon very susceptible to the influence of others. People with Pisces moon can have strong intuitions and even medium tendencies. There can also be a strong imagination, at times they could even seem to be “inspired.” There is a great love of things like poetry as well as a love of solitude. For the Pisces Moon there could be a strong desire for quiet and peace. There could be things from their past, decisions they’ve made, situation where there could now be some regret. Since they are so vulnerable to others when they do see the truth, there is going to be those moments of great regret. These are not the most social people, but they are kind and compassionate with those who are less fortunate then they are. For more articles check out the new moon articles under Predictive Articles. Check out how the cycle of the New Moon can affect you for the month ahead!